In full disclosure, I am a native Chicagoan. I proudly state “I was born and raised, South Side of Chicago” and I wear it like a blue ribbon earned in a 1st grade spelling bee. Being able to claim the South Side of Chicago is a badge of honor amongst other blacks like being able to say you were born and raised in Harlem or West Side of Detroit. It rings with a certain air of positive black culture. Growing up in the 1990s, I was a child of hearing the gruesome news stories about the crime and violence from the projects not overly far from the Hyde Park/Kenwood neighborhood I was raised, but I’ll never forget the story of Lenard Clark in 1997. I was the same age as Lenard Clark and he was beat up by fellow white teenagers in the Bridgeport neighborhood of Chicago. The perpetrators were reported as saying that this was to keep blacks out of their neighborhood. Automatically, native Chicagoans either remember this story or know where I’m going with this with the mere mention of the Bridgeport community. Bridgeport was (and still is, but barely), the predominantly working class, heavily Irish and Catholic, community on the other side of the tracks. This is the neighborhood that produced Chicago mayors–both Daleys and Michael Bilandic. As of now the Dan Ryan Expressway acts as yet another physical barrier with the predominantly black Douglas community now known as the Bronzeville area and even as a kid in the 1990s, my mother who was raised in the former Ida B. Wells public housing complex, attending Phillips High School was quite clear that blacks were not welcomed in Bridgeport growing up. Chicago, with its racial history resulting in the race riots of 1919 all the way to the Federal Housing Authority’s famous “red lining” map of the 1930s and post-World War II era all weave an interesting historical line of a troubled racial past and why race is very much at the center of the discussion whether people choose to see it or not. In the interwar era of the Great Migration, Chicago was ground zero for the notion of neighborhood based restrictive covenants both at the municipal and federal levels that under the law allowed for white only neighborhoods which of course resulted in black-only neighborhoods, laid the foundation for the high-rise “projects” to be built and led to egregiously unfair homeowner and lending practices of working class blacks. Ta-Nahesi Coates illuminated the ways in which this practice was carried out in Chicago and the impact on the actual citizens in his essay “The Case for Reparations” and the famous playwright Lorraine Hansberry let the notion of restrictive housing covenants in Chicago be a framework for her famous play A Raisin in the Sun. It’s ingrained in Chicago lore that there are certain neighborhoods blacks simply aren’t welcomed and has fueled the myth that Chicago is the most segregated city in America. As of 2013, Chicago is ranked #7 as the most segregated American city amongst the major population groups (Asian, black, Hispanic and white), but it needs to be noted that while blacks make up around 13% of the population, average [Author’s note: not sure what comprises “average” in this case] blacks live in a neighborhood with a black population of 45% or higher. 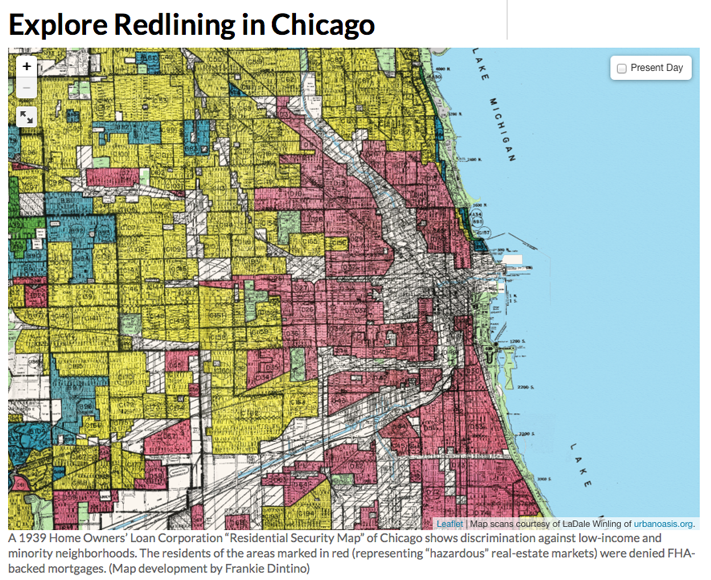 The way neighborhoods were created in Chicago, the 77 community areas, was a result of an FHA housing map from the 1930s that had actual red-lines drawn around certain neighborhoods deemed “hazardous” and those areas were defined almost solely by ethnic and racial boundaries. Enter the Chicago community of Mt. Greenwood. Mt. Greenwood is a smaller neighborhood on the far southwest side of Chicago, and is home to the famed Chicago High School for Agricultural Sciences and the only Chicago Public School with a farm as part of the high school’s campus–it was the last farm within Chicago city limits as late as the 1960s. The Mt. Greenwood neighborhood has a super-majority white population–85% at the latest estimation–and a black population of a mere 5%. The neighborhood is predominantly Irish and Catholic and to drive through the neighborhood, you might even question were you still within Chicago city limits. Whether officially noted or not, the Mt. Greenwood neighborhood was a place in Chicago where you reaped the benefits of city living without the urban element. Or if you found a better house you went across the street to Evergreen Park. Let’s be clear: getting the Jackie Robinson West league stripped of their title was all about race. Given the racial politics of Chicago and a few of it’s surrounding suburbs, having one mostly white team start a witch hunt against an all black team just smells of racist attitudes. I rarely use the term racist because often times people act on their ignorance based on prejudices and bigotry, but racist ideals and sensibilities often present themselves in larger ways that affect the metanarrative; it’s hard to label a person racist when so much of the system is slanted and a preferential treatment is automatically given to whites. Operating in white privilege often means the subconscious, and perhaps unintentional discrimination of denial of persons of color, but in this case it is clearly intentional on not just the denial, but the removal of an earned prize and more importantly, the title. 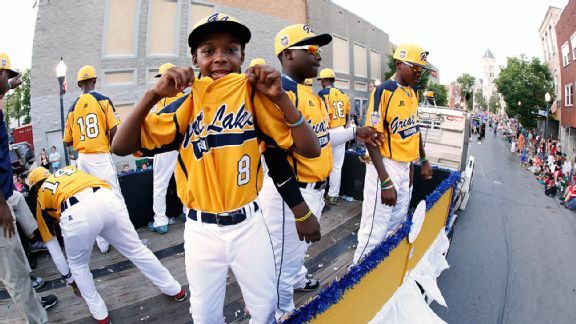 The national Little League association stripped the Jackie Robinson West squad, playing as the Great Lakes Region on the national level, of their national title. The team went on to lose to Japan at the international World Series level. The team of all black kids, and a star black girl as the pitcher, came home to a heroes welcome complete with a parade. It was celebrity treatment all around and it completely turned the image of black children on its head amidst the social fallout following the death of Mike Brown and later Tamir Rice about what a black person, even a black child, is supposed to look like. And the coaches of the Evergreen Park team didn’t like that. According to news sources these coaches and others somehow gained access to voter and vehicle registration and were able to prove that some of the kids did not officially live within the district boundaries, and that was grounds for the title to be stripped. There is a historical theme in Chicago that travels from the the race riots of 1919 to 2015 that sends the clear message to black citizens that it is not okay to be in certain places and that their mere existence is not welcome. Since the inception of this country, there has been an insistence that blacks must live within district boundaries where legislation such as the Fugitive Slave Act of 1850 were passed limiting the movement of even free persons of color. De jure segregation under the Jim Crow South not only attempted to make sure that blacks’ physical bodies were required to live within district boundaries, but was also an attempt to force the mind and soul to live within district boundaries as well. Lest we forget, the race riots of 1919 in Chicago were ignited on the segregated 29th Street beach when a white man was throwing rocks at a black citizen who subsequently drowned, the police officer in turned arrested a black man in the crowd. The Bridgeport community, of which the lakefront beach would be close enough to walk on a hot summer’s day, was also home to the Hamburg Athletic Club that was said to have played a huge role in the race riots of 1919 of whom Richard J. Daley was a 17-year old member. It was a very clear message from whites to blacks that says that blacks are not welcomed. On the surface, zoning and districts for various and sundry social and civic services at the state and municipal level makes sense. It is designed to give citizens a fair opportunity and access to those various goods and services. It makes sense that people should be able to have their basic needs met within their own district’s boundaries. But at the core, especially in a city like Chicago, it is clear that certain privileges are afforded to those who live in certain neighborhoods, and overwhelmingly those neighborhoods are divided by race. This is evidenced in the fact that Chicago is still #7 when it comes to housing within the city limits and suburbs, but we also see it in the ways school districts are created not just in Chicago but also nationwide. I remember growing up and as a resident of Chicago, and with parents who paid the same property taxes as all residents are required to do, I still was not eligible to attend any public school of my choice simply because of where I lived. As I said, I was raised on the South Side, but more specifically south of Roosevelt Road, also known as 12th street. At least during the years I was matriculating, the opening of schools like North Side Prep and Walter Payton Prep required “maneuvering” to attend these upper echelon scholastic enclaves, either through testing or because of geographical location. That maneuvering was finding a relative who met the residency requirement, one who stayed outside of the district boundaries, and using their address. The inverse was true for black suburban kids. There was always one or two classmates who we knew lived in Dolton or Calumet City who were getting an education in Chicago Public Schools. This is a tried and true practice, and something that stays relatively under the radar within the larger American culture when it comes to your geographical residence. It gets tricky when we hear of stories about how white high school basketball teams have historically gone to the ‘hood to recruit players just to boost their roster and use their coaches address or something like that. It’s all fine when predominantly white people benefit from it, but the moment it becomes clear that blacks are also receiving a privilege from this maneuvering, then suddenly it has to be stopped. It’s as if people don’t want to play on a level playing field. The institutionally racist ideology that dares people of color to receive any privilege reared its ugly head in the cases of Kelly Williams Boler who was actually prosecuted over residency requirements and found guilty in 2011. Or the even sadder case with a sadder ending of Tanya McDowell who was actually homeless–without a residency–also in 2011 was prosecuted for using a fake address. Both of these women are black, and both of their children were black children. The Wall Street Journal story shares the American classic A Tree Grows in Brooklyn about an immigrant family living in New York, and part of the story hinges on the fact that the parents were able to use another address to get their daughter into a better school. This is the American way–unless you are a person of color. The story of the all black little league team from the South Side of Chicago, that had the audacity to be named after Jackie Robinson, is yet one more tale in the sordid racial history of the city. This is a story that began during World War I as blacks from the South began migrating north with the creation of the Chicago Real Estate Board in 1917 that purposefully created these all white neighborhoods and district boundaries setting off a trend that acted as the model for real estate standards and practices across the country for the next two generations. Even in the post-WWII era, the intentional creation of suburbs, such as Levittowns had clear restrictive covenants associated with them in order to keep them white, and even once certain overt legalese was determined unconstitutional, the sheer nature of banks and lenders to grant mortgages to non-white families was extremely pervasive to the point of keeping neighborhoods almost 100% white. This story hopped, skipped and jumped its way into creating not only racially segregated neighborhoods, but also ethnically segregated neighborhoods in major northern cities like Chicago and New York. The final response after the Civil Rights Bill in 1964 led to what we know as white flight–whites leaving to the suburbs to maintain their all white communities. Or in the years following the busing crisis in Boston, white parents rather than have their kids attend school with blacks created the “Christian school” model that’s still in existence today. Enmeshed in this Gordian knot of racial politics with the Jackie Robinson West league is the intractable American ethic value at play. Less than a month ago #DeflateGate was actually something we were talking about in this country as the New England Patriots were headed into the Super Bowl with the sword of Damocles over their head. There was actual evidence that the balls were under-inflated in order to give them an advantage, and they suffered no consequences. To continue within sports, we all remember a few years ago when the bounty scandal with the New Orleans Saints resulted in a head coach being suspended for a year, but the counter being that “every one else is doing it.” While the privilege of the sports world with athletes being paid an obscene amount of money compared to the average citizen may be incomplete, the nature of the “every one else is doing it” holds for a curious conundrum. Ethically, that’s a problem in an of itself, however when we can see the ways in which race privileges a certain set within the context of “every one else is doing it” then we have yet another problem altogether. I echo the words of South Side Chicago pastor of the Faith Community of St. Sabina that this was a “witch hunt” by the powers-that-be associated with the Evergreen Park little league. This was the intentional racial politics that is as native to Chicago as cold winters. It reeks of the old dirty Democratic machine politics that ran roughshod over anyone that got in the way of Hizzoner Richard M. Daley like when Meigs Field was bulldozed overnight. But even more frightening is the way in which this comes off as patriarchal white people “taking back” what they believe is rightfully theirs. Perhaps in a perfect world where the social construct of race did not have such deleterious effects on people of color when it came to economic practices, the criminal justice system, or in the ways in which religious practices have helped undergird a jingoistic brand of American exceptionalism that works for everyone except people of color. This is beyond the inane hatred that whites people may harbor for their black Congressperson, for Al Sharpton, for even Barack Obama even. This is entrenched in America. This actually happened. But more specifically, this was not some ex-nihilo event. This was a result of a series of historical events that serve as ancient fuel drawing from the deep malignant wells of sophistry hell-bent on maintaining the status-quo. That status quo often does not share the same phenotype as I do, nor ontological location of being black in America. 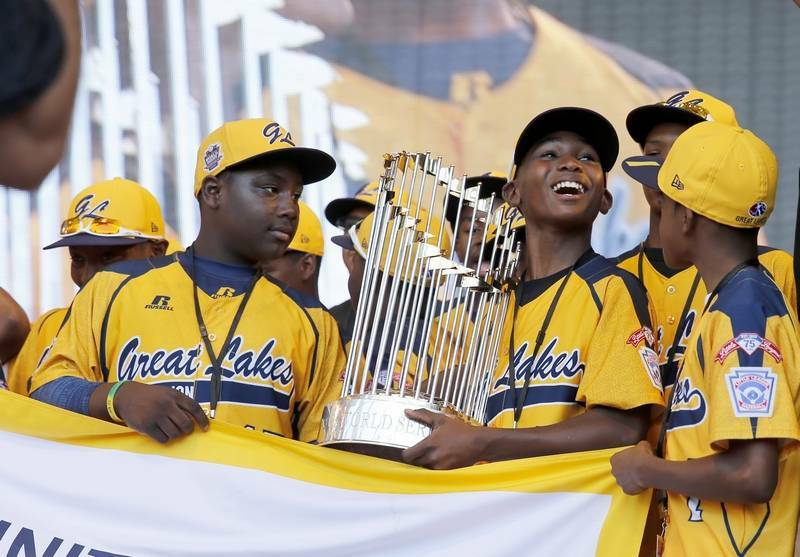 Let it not be forgotten, the individual players of the Jackie Robinson West little league won the game for which the title was stripped. They physically beat the Evergreen Park team mercilessly 43-2. To be on the international stage is a memory that no one can take from them, the experience that will define their childhood. Too bad they will be living in a country where racism also continues to define the lives its citizens. Land of the free and home of the brave, indeed. This is really sad. I feel bad for those young boys. Of course this is racism! This is AmeriKKKa after all!! Excellent blog. I agree. Stripping those youngsters of that title was a despicably racist thing to do. That’s because they don’t!…and are never going to allow such a thing to happen. I would say that I’m sad such an unfortunate event had to happen to some of the very best of our children, especially in sports, an area where healthy characters are built for a lifetime. If I could offer anything of wisdom, I would say that they shouldn’t be discouraged. Keep up the Winning Spirit that made them Stars and apply the same principles to other pursuits in life! But also view this event as a learning experience, just so they’ll know firsthand (and at an early age) just how unjust this current system can be. The coping strategies they will need for survival in their future pursuits can be further strengthened by parents who tell their children the facts and the truth about racism, as well as what was faced by our ancestors, what we are confronted with today and what challenges lie ahead in their individual lives. Let’s face it: whites are never, ever going to “get it”; not until they are at a level of being an absolute disadvantage as a totally incapable racial minority (sans current economic/social/political/militaristic tools) among People of Color, whether in Chicago, Calcutta or Caracas. As long as their system gives them a preference, even at minimum levels, over other non-white people, they are going to faithfully and relentlessly mistreat every one whom they classify as not white, in every aspect of a functioning life. They will never take time to consider the logic, merits or honor behind just treatment. Not until they are mistreated in the same manner. “If you don’t understand the system of racism, what it is, and how it works, then everything else that you do understand will only confuse you.” – Neely Fuller Jr.
the Jackie Robinson West team did not have a girl pitcher! Thanks for that correction. I think someone else mentioned that to me. I need to go back and correct it. People may think times have changed dramatically but they really haven’t. I grew up as a black teenaged male in a place not so far away from Mt. Greenwood and Evergreen Park in early to mid eighties. I experienced such racism that I know the children of that time which are now the adults that still live at the same areas have a history of be racist. Evergreen Park known for being A racially biased profiling now has really not changed much. As stated in the column underpining black success even though the people that would be hind the stripping of the title may not be aware of it was truly based on race and superiority. Black people can’t be better than them. Even if not knowingly racist it is subconscious because it is what was taught. Not all whites have adopted this pattern of thought. The fact remains that black people have to dramatically outperform whites, without the same resources on an uneven playing field just to live a comparable lifestyle as whites. Even if done it’s still not accepted. The young black men of JRW have just experienced one lesson in life as a black man in America. KEEP WINNING BOYS!! !